The neighborhood association is lucky to have several board members who are professionals in the area of real estate, law and architecture. They act on our behalf to preserve the integrity of the neighborhood by reviewing each zoning application and representing the membership in front of the City and County of Denver Board of Adjustments for Zoning Appeals and the City Council. An example of their work is their close interaction with the City and private developers to ensure that major infill projects in Hilltop and surrounding areas are compatible with the neighborhood and enhance the quality of life. If you are considering doing construction on your property, putting up a fence, or researching which projects require a permit or licensed contractor. If your neighbor is doing construction and you have questions or concerns: Procedures for Neighbors to Know. Need help with home improvement projects? See this page on the DenverGov website for links to resources for seniors and other residents interested in making upgrades or repairs to their homes. For the latest information on Denver’s Zoning Code, neighborhood classifications and regulations, and to find out the current zoning by a particular address or intersection, click here: Denver Zoning Code. What is the process for rezoning a property? Re-zoning is a public process. If a developer or a neighbor wishing to change the zoning for a particular property, they need to obtain neighborhood buy-in before they apply for re-zoning. This usually involves the developers speaking to surrounding neighbors in one-on-one meetings and in group meetings with the neighbors and the adjacent Registered Neighborhood Organizations and their members (Cranmer Park/Hilltop Civic Assn for example). If the developer decides to go ahead with re-zoning, there are opportunities for residents to offer public comments and send letters/emails/phone calls to the Denver Planning Department, Planning Board, and City Council. 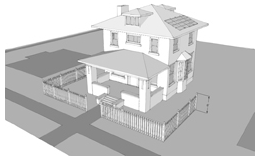 The formal process is for the developer to work first with the Planning Department. This department makes a recommendation of yes or no to the developer and to the Planning Board. If the developer seeks to continue and take it to the Planning Board, the Planning Board hears the proposal and conducts a public hearing. If it passes Planning Board, it comes to council committee, and if passing there it goes to City Council, where there is also a public hearing. For a more complete and official explanation of the process, visit Denver Community Planning and Development Apply for a Rezoning.